Polar explorer and writer Viktor Boyarsky talks about what should be done with the Greenpeace “pirates,” and why Russia needs the Arctic. 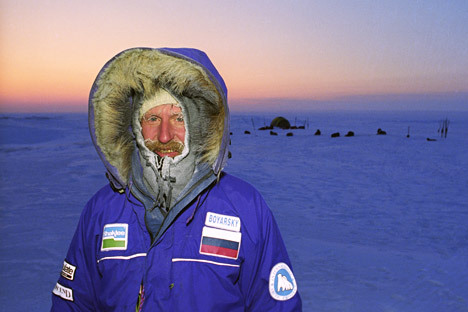 RBC reporter interviews Viktor Boyarsky, the famous polar explorer, writer, chair of the Polar Commission, and Arctic and Antarctic Museum in St. Petersburg. RBC: Mr. Boyarsky, your life is inseparably linked with the Arctic and Antarctic. You have just returned from another expedition there. Why do you think this region attracts people so much? Viktor Boyarsky (V.B. ): Everyone has his or her own reasons – for someone it is a thirst for discovery, another is looking for adventure, and the third has a desire to prove one’s self. Sometimes all these coincide. RBC: Is it appropriate to say that Russia began exploring the Arctic after the October Revolution? V.B. : By no means. A long time before that, Lomonosov had said, "Russia is a building, and the Arctic is its facade." Our potential did not originate after 1917. Recall the Great Northern Expedition in the time of Peter the Great. And the final act of conquering the Arctic was the Arctic Ocean Hydrographic Expedition of 1910 to 1915, which gave us the map of the Arctic we have today. In the 1920s, the importance of the Arctic for Russia was not even discussed; it was accepted as an axiom. The Northern Scientific and Trade Expedition was organized with the main purpose of research and industrial development of the Arctic territories. The new decree marked the beginning of large-scale research, and the greatest importance was given to the Northern Sea Route – 150 polar stations worked all over the Arctic, and new ones were established even during the Second World War. RBC: Are the statements of the authorities on a return to the Arctic just general comments or an actual program? V.B. : In the 1990s, we suffered a failure because of shortsighted policies of the government. Now, however, a restoration is actually being carried out, and not something only declared on paper or on TV. This year our fleet has managed to prove this. The military has always been the core for the development of infrastructure, all airfields were built for mixed use, including for strategic aviation. Civil infrastructure worked next to this military infrastructure. Now we are building 10 rescue centers along the Northern Sea Route. They will form the basis for the revival of infrastructure. We must turn our faces towards the Arctic and treat it with respect. The process of returning had to begin sooner or later, because our national interests are focused in the Arctic. First, the Arctic has huge reserves of mineral resources. Second, the longest part of our border lies there and it must be reliably controlled. RBC: Global media are discussing Greenpeace's campaign. What is your opinion of this environmental action? V.B. : I will not appear as original to you: I think that the methods used by these activists, whether it’s called a raid or an invasion, do not correspond to their stated objectives. They were in the economic zone of Russia, and they were in the area of the Northern sea route. We have our own rules in Russia, and we can demand that these be obeyed. The captain did not inform anyone about his plans, so the ship should have been arrested, and the captain’s license should have been revoked. We cannot let such actions pass without any punishment, in order to prevent repeated offences in the future. RBC: Should Russia develop the Arctic economically? V.B. : Yes, but always subject to the technical conditions and requirements. You should understand that one cannot do anything without risk today, there is no 100 percent guarantee, but using our many years of experience, approaching the matter carefully, one can prevent problems, and anticipate the consequences. I had an opportunity to assess how all this happens. And believe me – there is a great difference in how they used to work in the Soviet Union and how they work now. Back then, nobody cared if there was an oil spill or not. Now, there are foreign companies in the Arctic, and there are controls imposed by environmental organizations. Before the start of any development, the risks are analyzed, all the precautions are taken, and this happens not only in words, but also in deeds. We understand that we should not be our own enemies, so we must not scrimp on safety. RBC: How do you see the control over the Arctic? V.B. : The control will be carried out by the country that will have a real possibility to move its ships to any point, at any time of the day and night. We are gradually restoring our military presence, but we do not have plans to attack anyone. RBC: What are we missing for the development of the Arctic? V.B. : We need to improve the customs controls, because this is a problem today. We have such “swings” and contradictions that they reach the point of absurdity sometimes, when our icebreakers are given permits for international voyages instead of sabotage, and then our sailors cannot go ashore onto their native land. Until we do not switch something in the heads of our zealous guardians, the conditions will not change. Another important aspect of the development of the Arctic is tourism. There is a skeptical approach, saying that things will only get worse, due to the tourists bringing dirt and garbage. However, here, as well as in case with the development, the main thing is the right approach. Today, a person almost drops from exhaustion, before he can get a permit for the arrival of a foreigner. When it takes two months to get the approval documents, tourism loses all sense. We need a new mechanism, because if we can create an inflow of people, there will be an increase in the standard of living, we will restore airfields and other infrastructure. This is the abridged version of the interview first published in RBC.